Before I had kids, I always planned that when I did have them, I would limit their TV time. I never said I wasn’t going to let them have any, I just wanted to be sure they didn’t get a ton. I am not one that thinks TV is the devil…well not exactly anyway. I am one that believes strongly in moderation. For the most part, I want my kids to be playing, drawing, painting, creating, or reading and not just sitting on the couch staring at a screen hanging on the wall. But sometimes I also think a little TV is ok. Note I said a little. Lately, we have been having a little issue with my daughter understanding just how much TV is ok. Let’s just say sometimes she is not thrilled when I say no to TV (and by not thrilled I mean whining, crying, and generally throwing a fit). 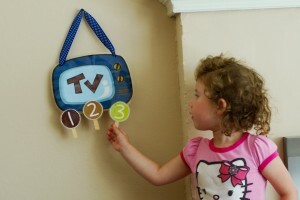 So I decided to use some of my professional background in visual schedules and reinforcement charts to create a TV Time Chart to help my daughter see visually how much TV she is allowed to watch in a day. I found a cool retro TV clip art at Graphics Factory (where I have a membership). I altered the colors and then printed it out on card stock, cut it out, and laminated it. I then punched holes in the top, strung some ribbon through, and hung it on the wall in our family room. I hot glued all the circles onto clothes pins so that they can be attached onto the TV. I hung the TV in the family room near the TV so that it can be easily used. 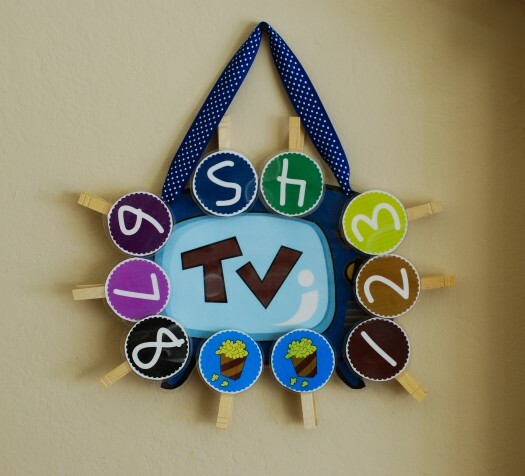 Each numbered circle clip represents ONE TV show (the ones my kids are allowed to watch are generally 20 minutes long). 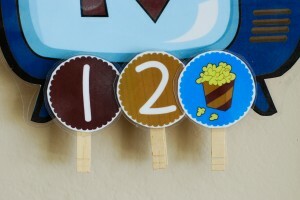 In the morning, I attach the number of clips on the TV that they are allowed to use that day. In order to be able to watch a show, my child must ask me to watch a show, and if I say OK, she must give me one of the clips. We talk about how many clips she has left so that she is always aware that at some point, there will no longer be anymore TV. MOVIES: In order to watch a movie she has trade in 2 or 3 of her clips to get the movie clip (depending on the day, what we have going on…etc). I also randomly put out a movie clip on days that I may need to get something done (or days we may not feel well and just need to relax). Time is a very hard concept for little ones to understand. You can’t see it. A great example is when we say “E, 10 minutes until bedtime” and she then retorts with “No mommy! 5 more minutes!” For little ones who are just beginning to understand that some numbers are bigger than others (like my daughter) this makes it even more difficult to understand time. Even if we told her that she can only watch 2 or 3 shows a day….the concept of “how many” is also something that at age 3 1/2 she is just starting to grasp. So giving a child some sort of visual example of time and quantity can allow them to understand exactly what they can/can’t have. Providing a child with a visual schedule or visual chart can help to decrease frustrations and tantrums and help them actually learn the concepts of time, time management, quantity, and so on. It is also a way for YOU to keep track of things and stay consistent! If you use this..please come back and let me know how you like it! Love this idea thank you! This is SO great! I have a four and a six-year-old and I actually use it with both of them. It is a great way to manage summer and winter break days for my school-age son who seems to lose all sense of time when the TV is on; and of course my four-year-old loves it! Thanks for posting the free download. It has helped our family immensely! Trisha I am SO happy to hear that this is helping another family! 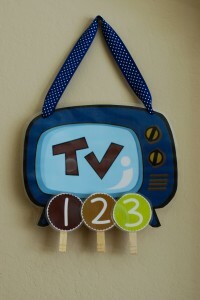 I have just found your blog post on managing TV time- it looks fantastic and ti be just what I was looking for!! I have just printed it and can’t wait to try it with my 3 and 5 year olds!!! Thank you thank you!!! PS… You just saved my after school drama and summer weekends 😀 LOVE IT! & Ty for sharing your personal experience in update ! I really love this idea! My son asks for tv right away in the morning. He is not allowed to watch it until after lunch. I can’t wait to start this. Katie, This is fantastic! We have been using this for the last week with our six-year-old daughter, and we’re all happy. The guidelines are clear, which is what we’ve needed in terms of screen time. Thank you for making it a free resource! I will also definitely be going through a lot more of your blog as I look for new ideas to use with my three-year-old son who has Down syndrome. We’re always working on his speech, so it’s fun to have fresh ideas.